Hey, that’s not my analogy, it’s Governor Cuomo’s. 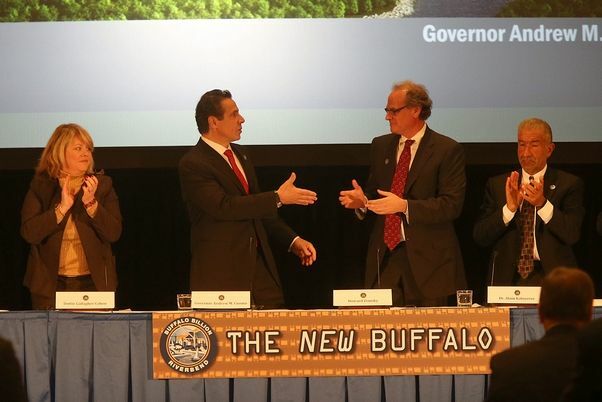 In announcing the investments in Buffalo this morning, Governor Cuomo said that the state investing $1B in Buffalo was like having five children, and on Christmas morning, handing a set of keys to one of them and saying, “Here are the keys to your new car!” The other four children get to share the old car. Two big photonics plays in one big announcement. I wonder if anyone in Albany realizes that these are photonics companies? Kalayeros likened the announcement to the Buffalo Bills winning the Superbowl. The real star of the show was the leadership example set by Larkin Development Group Managing Partner and regional economic development council co-chair, Howard Zemsky, whose disarming presentation and introduction to the governor were relaxed, intelligent and highly targeted. Zemsky’s leadership on the Buffalo Council ought to he the envy of every region in the state.